Our history and experience in agricultural processes uniquely gives our craftspeople the expertise to control and develop high standards at each stage of the supply chain from selection to maturation, to end-product refrigeration and presentation. Having our own farm, our own abattoir and our own shop to sell our beef, allows us to give people that essential element of trust that every consumer requires when they buy meat today in our store or order meats online. Our high standards are achieved by constantly assessing and re-assessing every aspect of our business. We do this by listening to our customers and our people. We dry-age our beef. This means that we use the traditional method developing the flavour. We don’t believe that beef can really mature if it is vacpacked in a plastic bag! When performing meat delivery, we use continual refrigeration to ensure your meat is fresh. Our technique is to keep our beef in a temperature controlled aging chamber. Gradually, as the beef loses moisture, it develops flavour and as the enzymes break down the muscle fibres, the meat also becomes more and more tender. The result is beef with a natural sweetness, a deep red colour and superb cooking and eating qualities. 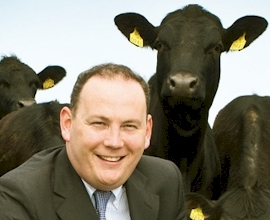 We concentrate on Hereford and Aberdeen Angus beef. The Hereford has been bred in Ireland since the early 1800s and produces the highest quality marbled beef from grass. We have maintained this tradition on grass feeding, a tradition which produces a beef of surpassing excellence and typicity.